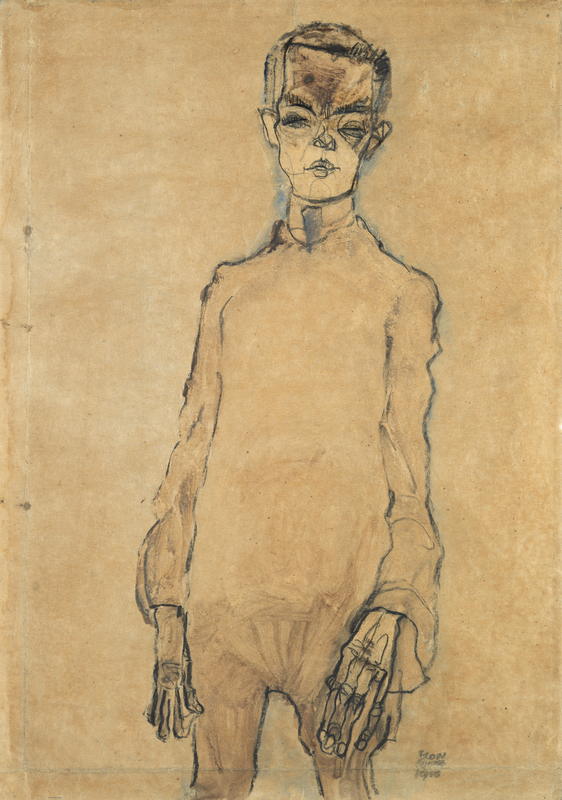 No artist was ever as obsessed with his own image as Egon Schiele. From 1910 onwards his narcissism, or his schizophrenia, led him to portray himself in all kinds of poses in numerous positions and gestures imbued with a very provocative brand of eroticism. The artist portrays himself both naked — in the manner of a wounded Saint Sebastian — and clothed, employing a vast repertory of disguises in the role of a caricature actor whose use of gesture verges on the grotesque. In the present watercolour his emaciated body, which stands out against the neutral background, is captured from a very low viewpoint in order to accentuate his skinniness, and the expressive gesture of his face recalls the exaggerated facial expressions sculpted by his compatriot the sculptor Franz Xavier Messerschmidt (1736–1783). As in most of his portraits, he combines facial gestures — in principle the best ally of expressiveness — with extremely elongated, bony hands.